I used a moisture meter on the transom and saw 80% moisture in the transom. I also used a small hammer to sound the hull and transom and 90% of the transom is hollow and the hull is chipped and cracking everywhere. You can push in on the inner transom because it is delaminating so bad. You can see the transom flex when you pull up and down on the drives. The transom is so rotten that all the gelcoat is spider cracked everywhere. The forward bulkhead in the bilge is rotten. 2. The motors and outdrives have been rebuilt- He has no receipts to prove any of this. 3. This boat was recently in the water and tested out great- his videos dont show him actually running the boat. The shifters are misadjusted and one drive wont go into forward and the other wont go into reverse. 4. This boat is well taken care of with plenty of life- This is the biggest lie. For a boat that is well taken care of why is all the cockpit upholstery rotten, the gelcoat on the hull bottom has multiple huge chips. There is a poorly performed repair to one of the lifting strakes. 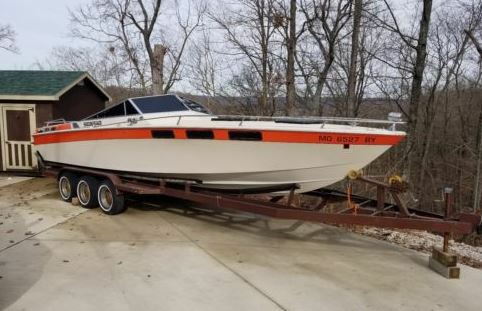 5-This boat is available for testing before the auction end I do have some video- This boat wont pass any water test, it cant go into gear and the port engine has a miss from a bad riser gasket or a bad head gasket. 6- This is a 40 yr old boat and shows wear on the interior and passenger seat needs repair but works. - Both front seats are rotten. My foot went thru the back seat bottom when I stood on it. All the staples on the upholstery are rotten and rusty and coming apart. 7- This boat has been stored inside and has always been in fresh water.- This boat was maybe stored inside before he got it 10 years ago but not it just sits outside collecting water. 8- The boat has 2 350 engines both are rebuilt with one engine having 300 hrs and the other with 250 hrs.- Again he has no receipts to prove any of this. 9- This boat was recently in the water and is water ready I can provide video of you contact me.- It is not water ready, the transom is completely rotten, the out-drives are misadjusted, some of the dash gauges have water in then from the boat sitting out in the rain, the port engine has milky oil. the trim tabs don't work. 10- Both out-drives have been redone within the last 300 hrs along with new impellers.- the U-joint bellow on the port engine is cracked and again no receipts to prove any of it. 11- Oil change ,batteries and tune up recently done. - Milky oil in both engine. The port engine starts hard and wont idle properly, the batteries are from last year. I have a Wellcraft and know the bad spots on these boats and of all the boats I have seen over the years this one is complete and utter GARBAGE. I fear the if you actually took this out in some good waves, the transom would break off after you fell back after the seat gave way. So how did the seller react to your review of the boat when you got there? I told him that there was no way this was water ready. One drive would not go into forward, the other would not go into reverse and the front bucket seats and back seat were completely rotten. The transom was completely shot. I told him about it and all he was concerned with was he was out his seller fees. I called Ebay to let them them know this boat was very unsafe and was a danger for anybody who bought it. glassdave, convincor, FASTTIMES and 8 others like this. Phragle- you are 100% correct. Unfortunately for most people they dont know how bad these boats can be. I knew going in that the transom would/ could be soft and stringers bad. The thing that irritates me is this clown said it was water ready and ready for any test and that he didnt sell junk. I asked him specifically about the condition of the cockpit upholstery and the hull bottom and engines and he swore up and down that everything was mint. I was so irritated with it that I actually called Ebay and talked to them to let them know that this boat was a safety concern and that someone could die on it when the boat sank. Last edited by glassdave; 06-26-2018 at 06:03 PM. I'd expect most of those issues on a 40 year old boat. How much was he asking? He had a CL asking for $7500 The ebay auction I won was for $5000. It was not even worth that.